April is National Poetry Month, and in keeping with that, I plan on dedicating a post each week to poetry. I'm looking forward to it, but I must admit that I'm not 100% certain which poems I will be writing about. If you have a particular poem or poet that you would like to recommend, please feel free to leave me a comment! I'm going to try a new thing where I post a food-related article a couple of times a month. These articles will probably be posted on Fridays, hence "Foodie Fridays." For the inaugural post of this undertaking, I've decided to blog on some of my favorite basic cookbooks. This is based on my experiences and opinion, so please feel free to add your own suggestions in the comments section! Clueless in the Kitchen: The author, Evelyn Raab, wrote this book with teenagers in mind, and it provides an excellent starter for anyone who is just starting to learn how to cook. The recipes are basic and are very approachable, and there isn't anything in the book that would be intimidating to a cooking novice. The chapters cover everything from breakfast, lunch, and dinner to desserts and vegetarian cooking. Most of the ingredients are pantry staples, and by keeping the ingredient lists and directions very simple, Raab makes cooking seem very doable. The recipes include helpful icons, which designate cheap eats, vegetarian recipes, and comfort food (aka "Mom Food"). In addition to the recipes, Raab also has helpful lists on what staples should be in the kitchen, including ingredients and tools. She even has instructions to help you with non-cooking kitchen tasks, like unplugging a drain, cleaning a stove, and defrosting a freezer. All in all, this would be a great cookbook for a someone getting a first apartment or someone who is just starting to learn how to cook. Raab also wrote The Clueless Baker (another book I recommend) and The Clueless Vegetarian (I haven't tried this book yet). Help! My Apartment Has a Kitchen: Written by a mother and son team, this book takes a humorous approach to cooking. With anecdotes, "Mom Tips," and "Mom Warnings," this book is similar to Raab's in that it is definitely for a novice cook. While the recipes aren't quite as easy as those in Raab, the authors do provide a helpful rating system that tells you each recipe's level of difficulty (going from "Very Easy" to "Not So Easy"), so you know what you are getting into. Furthermore, the "Not So Easy" recipes aren't too difficult, so once you get a little cooking experience, tackling those should be a breeze. 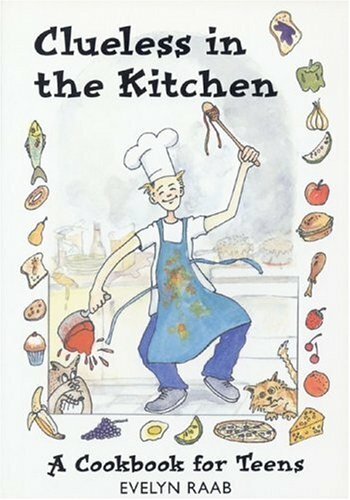 If you are looking for a good basic cookbook for a college student (and you don't want to offend said college student with a book that is explicitly for teens, because he/she is too cool for that), Help! My Apartment Has a Kitchen is a good compromise. It doesn't give the same level of advice and guidance as Raab's book, but it is a good place to start of the neophyte cook. 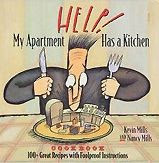 The Mills also wrote several other cookbooks, including: Help! My Apartment Has a Dining Room (good, but not quite as practical as this book), Chocolate on the Brain (good for the chocoholic and/ or baker), and Faster! I'm Starving! (I haven't had a chance to test this one out yet). How to Cook Everything: While The Joy of Cooking is the go-to basic cookbook for many people, I have found that Mark Bittman's How to Cook Everything is less intimidating and more user friendly. While the book is enormous, it does cover everything that you might need once you have mastered the basics. I also like Bittman's approach to cooking as something that is enjoyable, relaxing, and simple. While his ingredient lists are more involved than Raab's, they are also focused on the staples. Furthermore, Bittman offers a lot of ways to improvise and vary a basic dish. If the huge How to Cook Everything tome, which has 2,000 recipes, seems a bit too challenging, you can opt to get How to Cook Everything: The Basics, which, as the title suggests, has 100 core recipes that are the most practical. Poem Flow: This app is from poets.org, and it program that gives you a new poem everyday. The app itself is free, and with the app, you get 20 poems plus a week of poems-of-the-day. For $.99, you get three months of poems, and you can also buy a year's worth of poems for $2.99. This is one of my favorite apps. Besides letting me accumulate a portable poetry library, the app will also show when and where the poem was last read. For instance, when I open a poem, it will tell me the location of the last person to read poem and when this person read it. The app also has literary trivia for the included poems. If you don't have an iPhone or an iPod Touch and you are interested in this app, you can experience it at the Poem Flow website. 101 Classic Novels: If you are anything like me, there are probably a bunch of classics that you read (or were supposed to read) in high school but can't remember anymore. Luckily, this app has 101 classics to help you recapture those halcyon days of AP English. While most of the books are well-known classics (think Emma by Jane Austen and The Last of the Mohicans by Cooper), there are some less famous works as well as a number of children's classics, like Little Women and Anne of Green Gables. All in all, this is $.99 well-spent (I actually got mine for free because it was on sale!). IndieBound: I do have a great appreciation for Barnes and Noble, but living in Boston has also given me a profound love of the independent bookstore. The IndieBound app makes it that much easier to find an independent bookstore near you. However, the real selling point (for me at least) is that the app gives you access to various IndieBound lists, including "Great Reads" and "Notables" for each month. SnapTell: Although I can recount random pieces of information (like blocking to a play I stage managed 10 years ago), my mind is usually like a sieve. Too often, I see a book in a bookstore, tell myself that I will remember to go back and purchase the book at a later date, and then promptly forget all about it. However, SnapTell lets me take a picture of a book that I am interested in, and it will identify the book and store the information for me. It also gives the online price and the local price for the book in question. Did I miss something? Do you have other great iPhone app suggestions for people who love to read? If so, please feel free to comment - I'm always interested in finding more apps to download and review. Book Review: "Game Change: Obama and the Clintons, McCain and Palin, and the Race of a Lifetime"
Although the 2008 election was a long and bloody fight to the finish (particularly when you consider both the drawn-out Democratic primaries and the general election), it was also one of the most fascinating events in recent history. Such a rich and vibrant story has inspired numerous books, but the one that has gotten the most buzz is the recently published Game Change by John Heilemann and Mark Halperin. This book gives an insider's view as to what went on behind the scenes during the primaries and the election. Peter Segal of Wait, Wait... Don't Tell Me put it best when he described the book as reading "like a season of Survivor with the winner getting control of a nuclear arsenal." First things first, I have to mention that it is hard to know the veracity of events Heilemann and Halperin describe. Although the authors claim that they conducted hundreds of interviews with staffers and other people closely associated with the campaign, they also opt "not to identify the subjects as sources in any way" (p.x) in order to ensure candor. While this is certainly understandable, it does give the book a somewhat disingenuous air, and the recreation of scenes and conversations makes you wonder how much of this book is based on truth (or, as the case may be, truthiness) and how much is based on speculation. Furthermore, some readers might be turned off by the gossipy nature of the book. In a sense, Game Change is the perfect example of truthiness in that it focuses on the heart/ relationships rather than the political issues/ facts of the campaign. Instead of focusing on the politics of the race, the book centers on the candidates and their relationships with their staff members and spouses. This, naturally, lends itself to having a tone as dishy as an article from People magazine. I didn't find these two limitations too troubling when reading. In fact, Game Change is probably the most intriguing book I have read in a long time, and I stayed up until 5:00 am finishing it in one sitting. What is remarkable about this is that this book is not a "whodunit" in any sense. Going in, you know exactly what is going to happen: Obama will win the Democratic nomination and the election, Clinton will be Secretary of State. However, to their credit, Heilemann and Halperin's writing and descriptions are so engaging that it is easy to become caught up in the backstage happenings, even when you know the outcome. As far as the focus on the candidates and their relationships goes, I found that to be one of the most appealing aspects of the books. After months of watching the politics, issues, and public displays being played to death on cable news, it is interesting to read about what was going on when the cameras stopped rolling. Yes, the book veers into the tawdry, particularly when it comes to discussing and dissecting the candidates' marital relationships (the McCains and the Edwards's are particularly brutal), but it is also fascinating. As Halperin noted during a radio appearance on Wait Wait... Don't Tell Me, "You know that you got a lot of marital dysfunction when the Clintons have, like, the forth most dysfunctional marriage in the book." In addition to describing John McCain's tirades (he has a profane one where he is yelling the "f" word at his wife while making an obscene gesture) and John Edwards's intense megalomania, which is so over-the-top that it would be funny if it weren't so utterly misplaced, Game Change also delves into the Clinton campaign and how it imploded into chaos. The book is particularly detailed in describing the personality disagreements among Clinton's top campaign staffers and in Bill Clinton's complex and troubled role in the campaign. Surprisingly, the authors go somewhat easy on the easy target of Sarah Palin. While they do question Palin's intelligence, knowledge, and sanity (at one point, the McCain staff is worried that she has a mental disorder), they lay most of the blame for her meteoric rise and dizzying fall at the feet of the McCain campaign, which they say did not vet her properly or prepare her for the the scrutiny that she would be under or for the rigors on the campaign trail. Although compulsively readable, the book isn't perfect. It does seem to go a little soft on Obama; perhaps this is partly because of his victory, but the authors make the argument that he is so cool and controlled that there wasn't a lot of real dirt to dish. Also, the book neglects some of the most electric moments of the campaign. Conspicuously missing are the backstage drama and analysis to election night (the book skips from the day before the election to the day after). That said, the book serves as a reminder to why this election was so dynamic and so different. Read it, remember that crazy period, and laugh at the authors' funny and sometimes caustic observations (best line: "What no one realized was how severely Palin's bandwidth was constricted"). I know it seems perverse that my first book review in a while is for a play that was written over 50 years ago. However, while I had seen numerous versions of the play and movie of the life of Helen Keller (including that awful Disney remake starring the one-time Pepsi girl), I hadn't read the play until earlier this year. With the revival of the play, starring Abigail Breslin, now on Broadway, it seemed like a timely opportunity to review Gibson's text. Before reading The Miracle Worker, I had a number of prejudices concerning the play. While I cannot deny that Helen Keller's story is powerful and inspirational (two buzzwords we are all sick of hearing after NBC's incessant Olympics coverage last month), I was never able to connect with the text. Some of the lines, such as "How does a bird learn to fly? We're born to use words, like wings, it has to come," struck me as overly didactic when watching the play or the movie, and some of the conflict seemed too forced (in addition to Helen's fight to overcome her problems, must we also have a patriarchal, distant father?). Although these problems remain, I found them much easier to overlook when reading the play. In fact, I found reading the text to be a surprisingly enjoyable experience. In print, the play comes off as startlingly modern, since the action often cuts from Annie Sullivan's memories of growing up to the Keller household. However, what truly surprised me was the richness of Gibson's stage directions. Rather than just seeing actors trying to carry out the actions and emotions he dictates, reading the directions offers an evocative and sometimes moving experience. In fact, the stage directions read like prose and convey a world of depth that isn't always apparent in production. Kate moves to Helen, touches her hand questioningly, and Helen spells a word to her. Kate comprehends it, their first act of verbal communication, and she can hardly utter the word aloud, in wonder, gratitude, and deprivation; it is a moment in which she simultaneously finds and loses a child. This elegant phrasing succinctly puts into words what Kate is experiencing, since this is the moment that she has gained the opportunity to communicate with Helen and relinquished her role as the most important person and guide in her daughter's life. The opportunity to get into Kate's head and heart allows us to experience this sense of wonder and loss first hand and gives us a greater sense of insight that is lost in a stage production. The Miracle Worker is not a perfect (or, perhaps, even a great) play, but I urge you to take the opportunity read the text. Even if you have seen the play or film, reading the play might give you a deeper appreciation for the work and for what Gibson was trying to say. As a child of the 80s, I have a soft spot for cheesy sitcoms. One of my favorites of all time is Perfect Strangers. Yes, it could be stupid and was probably very offensive to some people (as TWOP once noted, in this show, "Greece = outer space"), but I still have very fond memories of it. To my surprise/delight, Mental Floss featured the credits (albeit as an example of a bad television credit sequence), and someone in the comments section that there was a shot-by-shot remake of the sequence available on YouTube. I am not ashamed to admit that I have watched the sequence several times today, and I have downloaded the theme song (soon to become my new ring tone). Enjoy the videos - I am off to do the "Dance of Joy." If it has been a while since you've seen the original set of credits, the creators of the recreation did a helpful side-by-side comparison, which is also available on YouTube (the width prevented me from posting it here - sorry!). Although I know that I have been neglecting my duties as keeper and poster of this blog, I have some blog wanderlust. Namely, I've been thinking about creating a second blog (while still updating this one). The second blog would be dedicated to all things related to food, including cookbook reviews and recipes. If I started the second blog, my aim would be to alternate posts between my two blogs every week. The second option I've been considering is just posting my food-related musings here. So, dear readers, here is your chance to give me some feedback. Please feel vote for the option you are most interested in seeing me pursue in the following poll. You are also welcome to leave me a comment on what you are interested in seeing.